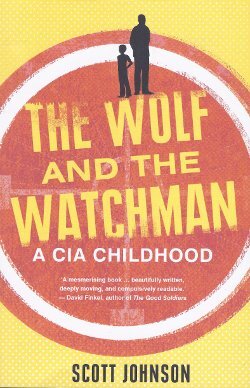 This book is subtitled 'A CIA Childhood', and on its most obvious level that's true, because Scott Johnson grew up with Keith Johnson, the CIA operative who was also his father. So there's the hook. You expect to learn something new about the functioning of America's spy agency in this book. In some respects you do, but the pure, overall excellence of this highly readable book and the ambition of the author - who tries to excapsulate a lifetime of observation and frustration in a few hundred pages - mean that it is also a lot more than this in fact. The chapter where this passage appears is titled 'Baghdad and Amman, 2008'. Amman is the capital of Jordan, the city where Scott goes to make the connection that will lead him to a person like Abu Ahmed, who is working in the Iraqi counter-insurgency along with his handlers in the CIA. All of the book's chapters are labelled with place names and dates, so you can follow the chronology of Scott's awakening. Getting to meet Abu Ahmed, as a journalist, is something of a coup for Scott. Establishing the tie required a quantity of negotiation with a broker in Amman whose trust it was necessary for him to secure in order to set up the first meeting with Abu Ahmed. There turn out to be many meetings with Abu Ahmed, whose trust he also eventually secures. To secure the broker's trust, Scott put in operation some advice he had received from his father in Washington State, in 2001. Sitting in the office of the broker in Amman seven years later, Scott leans on these words as on a staff and secures the access he had coveted. Access to the source was important to Scott professionally; without it there would be no story. He had been working in the Middle East for long enough that he knew that if he wanted to really understand the insurgency in Iraq he needed access to a person such as Abu Ahmed. But there's also more than this involved in the transaction. Scott had long been on a journey of discovery that had at its centre his father. Scott comes to understand the man whose secret had made itself felt in his life from the beginning, even before the time, when he was 14, that Keith had told him that he was a spy. It's this quest plus the general beauty of the writing in Scott Johnson's book that generates a feeling of frustration for the reader reading the book. What is the secret? I wondered, as I worked through yet another chapter of the memoir without discovering what it was. But it's a sweet sensation, a type of yearning. To compensate for that empty feeling, the language is often very beautiful, very concentrated and concise. The concision and concentration has to do with the journalist's craft: the effort to render meaning in as few words as possible. The prose has at times what some people might characterise as a Hemingwayesque feel to it. You feel at the end of the book, however, that the length employed by the author to convey the truths he discovered was necessary to achieve his purpose. Perhaps it's the same with the tradecraft Keith employed during his working life. To understand how the machine works you must be acquainted with the operations of its parts in some intimate detail. And to understand Keith it is also necessary to understand Scott's relationship with his father. There is a lot in that relationship that is routine, in the sense that sons always have 'issues' with their fathers. Every man who reads this book will find something of his own story told along with the story of Scott and Keith. The quotation from Neitzsche that graces the front of the book suddenly makes sense once you have finished it. So who is the wolf, and who the watchman? Within the ambit of Scott's youthful anxiety about his father's persona - the spy might also be misleading people at home - you conclude that Keith is the wolf, and Scott the watchman. But by the time you reach the end of the book you attain a different point of view. At this point in the narrative, Keith has become the watchman, and the wolf represents those forces outside the home that would do harm to its inhabitants. But once you get to this point there still remain a few blank spaces in Scott's story that your own intuition fills up for you. You ask yourself about Scott's sense of nationalism, for a start (you have your own issues with secretive organisations that appear to operate supra-democratically). You also ask yourself if Scott has been acute, or honest, enough to fathom the nature of Keith's relationship with his first wife, Scott's biological mother. Why did the marriage fail? Is there something in Keith that was faulty? Or did the secrecy necessary for Keith to maintain a private life ultimately fail the family? Keith's relationship with his second wife, Scott's step-mother, was not great either. While the second of these questions may remain unsolvable, and may simply reflect the fact that all sons blame their fathers for not loving their mothers enough, the first question, about Scott's sense of nationalism, remains outstanding at the end of the book. Or, at least, it did for me. As for the publishing of the book itself, it appears that it took Scott some years to complete the process. That he chose an Australian publisher to produce the book says a lot about the aspirations of the company, Scribe in Melbourne, and the skill of its editors. Because this is an excellent book, and an unusual one. Memoirs are by their nature very personal things. The scope of this one, and the ability of its subject-matter to interest the general reader at the same time as its author does a number of difficult things, is also just outstanding.